The OMB-DBK45 card provides OMEGA’s OMB-LOGBOOK and OMB-DAQBOARD-2000 Series data acquisition systems with four differential analog input channels equipped with low-pass filters and simultaneous sample-and-hold. The OMB-DBK45 provides a wide selection of full scale inputs. Each channel features its own instrument-ation amplifier with gain ranges of x1, x10, x100, x200, and x500, as well as individually configurable low-pass filters. This lets you maximize your signal via the OMB-DBK45’s input ranges, low-pass filter the output, and simultaneously sample and hold all channels before digitizing with the OMB-LOGBOOK and OMB-DAQBOARD-2000 Series. Up to sixty-four OMB-DBK45 cards can be attached to one OMB-LOGBOOK and OMB-DAQBOARD-2000 Series, for a total of 256 differential inputs. Each OMB-DBK45 channel is equipped with a low-pass filter that is user configured for cut-off frequencies from DC to 50 kHz, and for Butterworth, Chebyshev, or Bessel characteristics. The OMB-DBK45’s frequency determining resistor and capacitor locations are on machined-pin IC sockets for maximum flexibility. 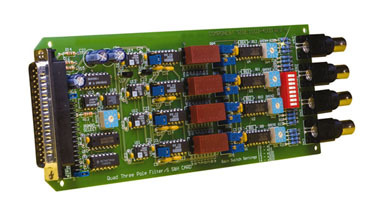 The card is provided with blank plug-in headers for each channel, to which you can add passive components for particular frequencies. Preconfigured plug-in headers for several preselected cutoff frequencies are optionally available.